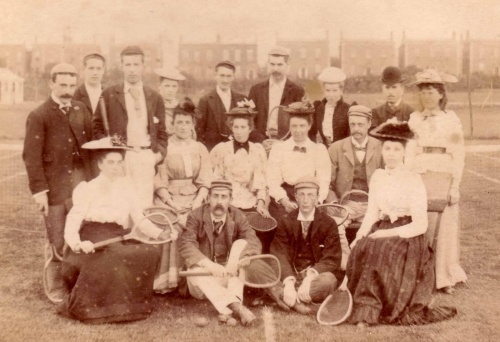 This tennis club photograph, 1890s, shows a version of late-Victorian tennis dress for mixed players. 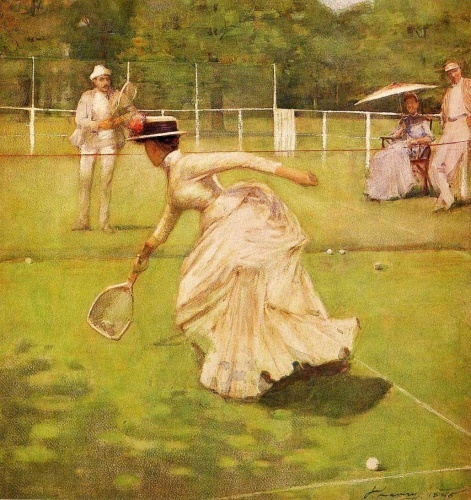 In 1875 lawn tennis was first included in the activities of Wimbledon’s All England Croquet Club (founded 1868) and in 1877 the club, re-named The All England Croquet and Lawn Tennis Club, instituted the first Lawn Tennis Championships. This celebrated annual event remains the greatest international tennis tournament and Wimbledon champions are undisputed style leaders on the courts. Here we look back at some of the cumbersome modes worn before the evolution of more modern tennis gear. Early male tennis players enjoyed some freedom from the constraints of regular dress and favoured similar clothes to those already worn for sports like cricket. During the 1870s generally a loose white shirt was teamed with trousers or with knee-length knickerbockers and stockings, a lounge jacket typically worn at the start of a game, but often discarded during play. In the 1880s some players adopted striped sports shirts or crew-necked jerseys: by late-decade white flannel trousers were usual, worn with soft, rubber-soled canvas shoes. During the 1890s a plain or striped flannel blazer became fashionable, often accessorised with a round sportsman’s cap, the blazer pocket bearing the wearer’s club badge. Otherwise ladies’ tennis dress displayed conventional fashion features, even the cumbersome projecting bustle during the mid-late 1880s. The National Dress Society (later Rational Dress Society) advocated more appropriate garments, suggesting the removal of hampering corsets and even adoption of a practical bloomer costume. However female bloomers resembling men’s knickerbockers were widely deemed unattractive and rarely worn for tennis. This was also true of the ‘comfortable divided skirts’ or curious ‘expanding dress’ enthusiastically proposed by health writer Ada Ballin in The Science of Dress (1885). 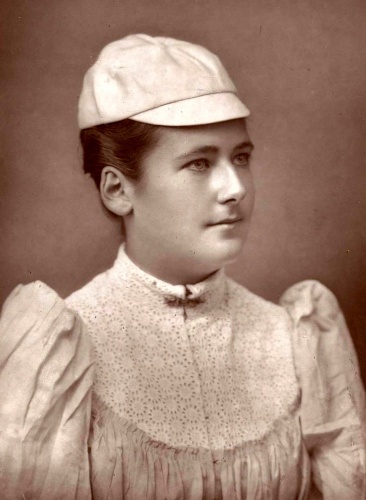 At the century’s close, Lottie Dod, Wimbledon champion during the late-1880s and 1890s, yearned for ‘a suitable attire for women’s tennis which does not impede breathing’. 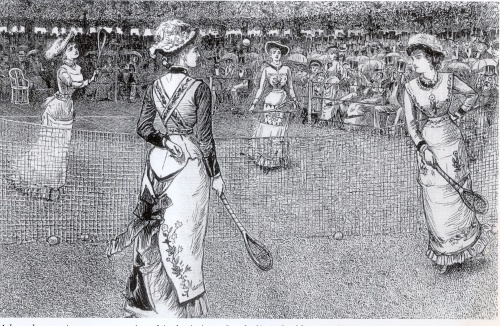 Women’ tennis dress continued to follow fashion, although the separate blouses and skirts worn in the early-1900s proved more comfortable than fitted Victorian gowns, while new wide skirt hemlines were worn several inches off the ground, making movement slightly easier. In 1905 American tennis player May Sutton shocked Wimbledon by rolling back her cuffs to reveal her elbows, her sleeves ‘too long and too hot’: this bold move helped to further the concept of freeing limbs from constricting garments. These garments were underlined with one or more thick petticoats and knee-length knickers, substantial layers that ensured the light did not shine through, immodestly revealing the player’s silhouette. Male tennis wear changed little between the early-1900s and the late-1920s, when dress in general finally grew more relaxed and a comfortable open-necked shirt replaced the formal collar and tie. By the early-1930s short-sleeved shirts were becoming acceptable and simultaneously an even more daring development occurred. In 1933 Bunny Austin was the first male tennis player to enter a major public competition wearing not trousers, but shorts. His lead soon followed by others, he was championed by the Men’s Dress Reform Party, who had already been advocating shorts for sports and leisure wear. For some years shorts and long trousers co-existed on the courts, but by the late-1930s shorts were the favoured option: in 1946 Yvon Petra was the last man to win the Wimbledon title wearing long trousers. Women’s tennis wear was revolutionised when Frenchwoman Suzanne Lenglen played Wimbledon after WW1 wearing a flimsy, un-corseted, calf-length cotton frock with short sleeves, a length of silk chiffon worn as a headband. Tennis dresses rose to the knee in the late-1920s, by which time Californian Helen Wills Moody had also introduced the golf-style visor as a practical and stylish accessory. In 1931 Spanish player Lili de Alvarez shocked Wimbledon by wearing a divided skirt resembling culottes, created by fashion designer Elsa Schiaparelli – the introduction of female ‘shorts.’ During the early-1930s a debate raged over culottes but by the end of the decade tailored women’s shorts and short-sleeved shirts were an acceptable alternative to pleated skirts and dresses. Gertrude Moran (‘Georgeous Gussie’) caused the last major sensation in 1949 when she wore an extraordinarily short white Ted Tinling-designed dress that revealed glimpses of lace-trimmed knickers. 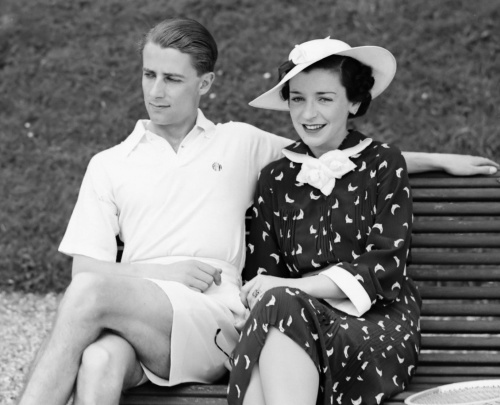 Past Wimbledon players braved publicity and boldly championed game-enhancing dress innovations that extended beyond the realms of tennis, pioneering some of the comfortable, relaxed clothes that we take for granted today.